The top two pics are from October 2012. The bottom two are from June 2013. 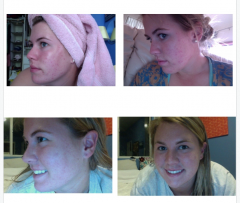 I had tried everything under the sun to cure my acne... I finally gave up until I found the regime. I liked the price so I tried it; stuck with it, and seven months later, when I thought all hope was lost, now have relatively clear skin. I still have redness spots that will go away eventually but now no more acne! I have been doing the full dose of Bp and am in my third week. My skin is almost clear, but my nose is covered in large blackheads. The BP and jojoba oil seem to be drying it out but it isn't a peeling mess. Over time will the BP heal and shrink the blackheads? I'm tempted to exfoliate my nose but don't want to aggravate my skin and undo the hard work of just being gentle. (I used to exfoliate twice a day.) Will this regime also heal hyperpigmentation a/k/a melasma with time?